A versatile dog, full of fun and character. An excellent dog for children, with a non-moulting coat and enough mischievousness to keep you entertained all day! These rascals may have glamorous good looks, but don’t be fooled — they love to play and have a bit of rough and tumble! Here’s our guide to this handsome, lovable rogue who loves his family — and also getting into mischief whenever he can! Soft-Coated Wheaten Terriers are lively, inquisitive, and bouncy; they love to show affection by giving kisses to everyone they meet. With this in mind, if you prefer a dog to keep his emotions in check, they are not the breed for you. They have a great sense of fun, and love to make their owners laugh, and Wheaten Terriers are described as good family dogs, as they will fall in love with the whole family, not just one individual. 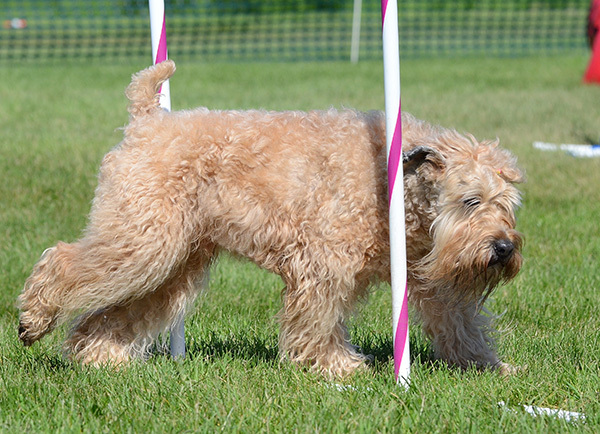 They are also very sociable with other dogs, and breeders describe them as less ‘scrappy’ than other terriers. They will aim to introduce themselves to everyone they meet, dog and human alike, so it’s vital that they have plenty of early socialisation and training to keep their enthusiasm in check. Soft-Coated Wheaten Terriers will be happy to walk for as long as you want to, but they should have a minimum of an hour’s walk a day, with 30 minutes in the morning, and then 30 minutes in the evening. If this isn’t possible, then this isn’t the breed for you, as Wheaten Terriers love to be out and about, spending time with their owners. As they possess great intelligence, and have high energy levels, they are also very good at activities such as agility and obedience. But breeders describe them as stubborn, and they are prone to selective deafness if they think their way of doing things is better! Firm but fair training is necessary, to ensure they know you are in charge. This is especially true when the breed reaches adolescence at around 18 months old, and goes through the challenging ‘naughty teenager’ phase. Renal dysplasia (RD) — a congenital disease which causes under-development of the kidneys. Protein losing nephropathy (PLN) or protein losing entropathy (PLE) — a condition where large plasma proteins are lost from the blood or gastrointestinal tract. It is vitally important that your dog is tested annually for this disease. Canine degenerative myelopathy (DM) — a degenerative disease of the spinal cord, which occurs in older dogs, and eventually leads to paralysis. All reputable and responsible breeders will test their dogs for these diseases to ensure their puppies are healthy. 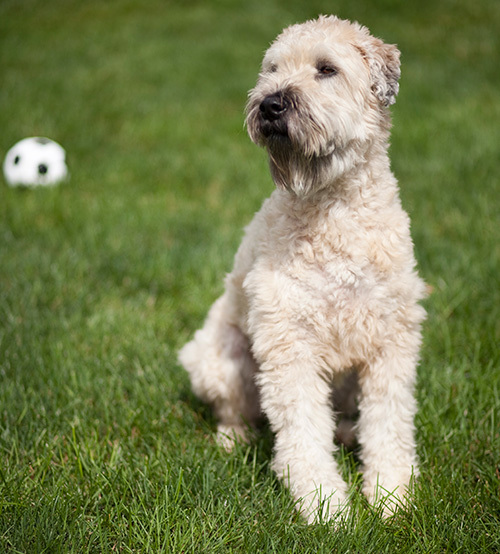 It is also recommended that Wheaten Terriers are eye tested to ensure they are clear of conditions such as progressive retinal atrophy (PRA), persistent pupillary membranes (PPM), and retinal folds. Soft-Coated Wheaten Terriers’ coats come in a broad spectrum of colours, from pale cream to a dark, golden colour. But while Wheaten Terriers’ coats are unusual in that they don’t moult, and are unlikely to smell, they will need daily grooming and combing so they don’t become matted, or develop knots. It’s important that you establish a grooming routine to keep your Wheaten Terrier looking his best, and it’s suggested that this routine is established at as young an age as possible. Your breeder should be able to talk this through with you. Grooming is particularly intensive during the ages of eight to 24 months, when the puppy coat is changing to the adult coat, and it may first appear quite wiry, but, with proper grooming, will then develop into silky waves. The Soft-Coated Wheaten Terrier is described as a family dog, and breeders would say they are best living as house dogs, and being treated as one of the family. Wheaten Terrier puppies are known to be very exuberant, and, being so people orientated, must be carefully home-raised and thoughtfully socialised with sensible, positive training. All responsible breeders will tell you that they don’t like to be left alone in the house for long periods, so this is not the breed to get if you are out at work all day, unless you can take your dog with you. DID YOU KNOW? The breed originates from Ireland; they were used as farm dogs, and can be traced back over 200 years.